The self-watering hydroponic system of these vintage-inspired planters makes it easy to grow leafy greens. Here's the dirt on windowsill gardening: All you need is one of Sarah Burrows and Nick Behr's pretty mason jar kits, a little water, and a sunny spot to grow super-nutritious, organic leafy greens indoors. You can enjoy homegrown farm-to-table salads any time of year. There's no guesswork over whether the soil has the right amount of water, because the passive hydroponic system regulates moisture, and also brings nutrients to the plants. The frosted, sea green and blue-tinted jars protect the roots from direct sunlight. Plant the included seeds of your choice, put water in the reservoir, place the jar in a sunny window, and get growing. Exquisitely tender, flavorful greens will soon be on the scene. Choose Cress & Arugula or Bibb Lettuce & Spinach. You're going to want more, so we've got replant kits, too. Assembled in Chicago, Illinois. I grew up with a garden and now live in a city apartment. I'm very glad to be growing food again! 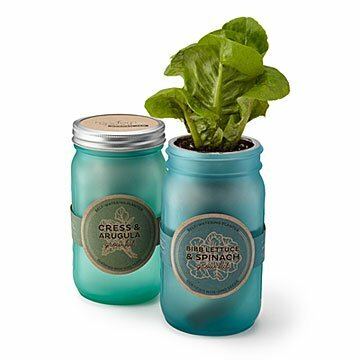 This item is perfect gift for someone's kitchen windowsill, and will be great for the winter and spring while the outside weather does not permit the ability to grow your own fresh greens outside. In fact, I thought that this was such a great idea I bought one for myself too!!! !